An image from the Hubble Space Telescope has astronomers baffled once again. 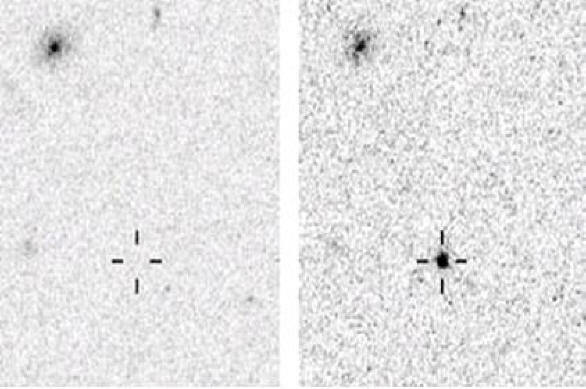 "...inconsistent with all known supernova types, is not matched to any spectrum in the Sloan Digital Sky Survey database" of vast numbers of objects. "We suggest that the transient may be one of a new class." As Barbary and his colleagues indicate, the closest they can come to the characterists of SCP 06F6 are quasars whose "hot gas" envelopes absorb radiation emissions at specific frequencies. However, a spectrographic analysis of the newly found object reveals nothing recognizable to the team. They are unable to determine if it is in our own galaxy or somewhere much farther out in deep space. One speculation suggests that the radiation profile could be from gases falling into an undetectable supermassive black hole (SMBH). As gas collides with material orbiting within the intense gravity field generated by the SMBH, it becomes superheated―often to temperatures exceeding ten million Kelvin―and is heavily ionized. Indeed, one absorption line was identified as Fe X (ten-times ionized iron) that is often seen in the Sun's corona during a solar eclipse. Could this clue be pointing to what has actually been observed? Ten times ionized iron is atomic iron with ten of its electrons stripped away. Conventional theories propose that the ionization occurs when the iron atoms collide with other atoms because the solar corona is at such a high temperature. The energetic collisions positively charge the iron, making it an excellent conductor of electricity. Charge separation occurs in the Sun's corona (and presumably in other stars), forming double layers in the plasma. It is the explosive collapse of double layers that causes solar flares and other phenomena to erupt so violently. In these pages we have often referred to Hannes Alfvén and his quotation about double layers in space. He was of the opinion that they should be considered a new class of celestial object because they are known to produce gamma and x-ray bursts when they explode. (Alfvén, H., "Double layers and circuits in astrophysics", (1986) IEEE Transactions on Plasma Science ISSN 0093-3813, vol. PS-14, December 1986, pages 779-793). Space is filled with cells and filaments of plasma, some radiating in arc-mode and some radiating at frequencies that are invisible to the naked eye. Electromagnetic forces in plasma are much more powerful than the “gravity-only” force that prompts modern cosmological theories. Because Birkeland current filaments connect cosmic bodies in circuits like light-years-long transmission lines, an overload response to surges in the flow of galactic electricity could be what astronomers are seeing in SCP 06F6. An invisibly radiating star might have split due to electrical fissioning in order for the larger surface area to accommodate the increased current. In a previous Picture of the Day about V838 Monocerotis, a similar mechanism was described. "After 100 years of neglect, an electrical model of stars is just beginning to emerge. It is an engineer’s view that offers a coherent understanding of our real place in the universe (cosmology) and practical insights for the future exploration of space. If the Sun shines as an electric light ‘plugged in’ to the Electric Universe, the objective tests become obvious. Perhaps, with a real understanding of stars we may reach childhood’s end in the cosmos."